I’m going to go back to November for a moment: Back then, I promised that I’d be around blogging throughout the Christmas season, providing you with holiday wrapping ideas. I was expecting a baby at the end of that month, and I knew working was out of the question, but I thought I would be able to blog. Not a lot. I had low expectations and didn’t set out any specific frequency for my blogging. I just figured I’d be able to squeeze in a post or two here or there. Silly me. Little did I know that the first weeks of taking care of a newborn are insane. After my son was born, I barely touched a computer for two months. 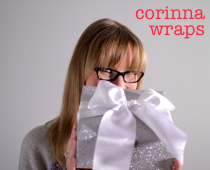 And besides a few prescheduled posts, that meant nothing new here on the Corinna Wraps blog. Well, five months later and I’m back. Hello. How have you been? I’m excited to be be back blogging again, and I’m even more excited to tell you about the other big project I’ve been working on. In addition to a new baby, I also have a new company, Gift Horse & Co. Gift Horse & Co. is a premium gift wrapping subscription-box service. Every two months, subscribers will get a box filled with awesome papers, ribbons and other gift wrapping supplies. Please check out the site at GiftHorseAndCo.com for more details. Subscriptions will be available this Thursday, May 15th — and I hope you’ll be one of my very first subscribers! Tags: Gift Horse & Co.